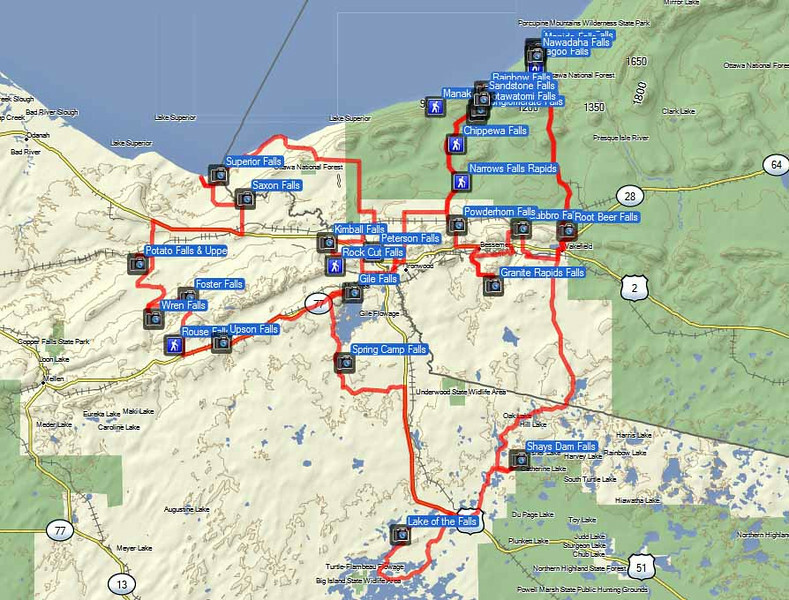 Just finished up a new track that takes in up to 30 waterfalls in NW Wisconsin and the western UP of MI. The path is 263 miles long. It can be done in one long day, or if you spend more time at the falls (or do some walk-ins), it makes a nice two-day trip. It is also within range of the Central ADV Rally. A very nice ride through some scenic country. Cannon, a great track as usual. This is my back yard! 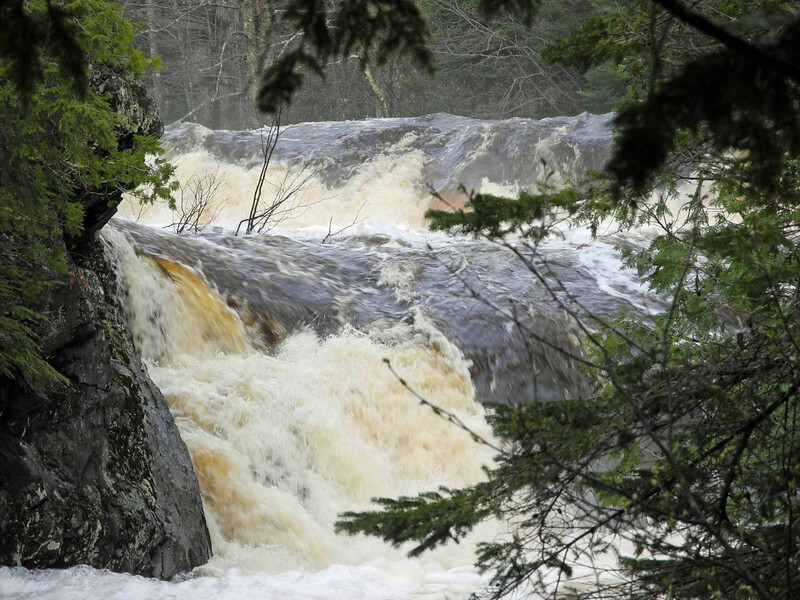 I hope you don't mind if I make a few comments that may be of help to people running this one (which would be great right now- the falls are spectacular with all the rain we've had). Wren Falls is one of my favorite places- I camp there a couple times a year at least- but getting there can be a challenge. The road in, from where it leaves Casey Sag and goes south, can be a real mud hole, even later in the summer. I've had tough times getting through on a 350; don't think I'd want to try it on a big bike. Especially after wet weather. A quicker way to get to Foster Falls is on Sullivan Fire Lane, off Hwy 122. Go north from Upson, ride the fun twisty part around Whitecap ski area (make sure to check out Corrigan's Lookout), then approach Foster's from the east. Then head back to 122. This is quicker and easier than coming in from the west, especially if you don't plan to tackle the road to Wren. Manakiki Falls is great but unfortunately it's on private land and the property owner has started gating all the roads in due to repeated vandalism to his logging equipment. It's commercial forest land so hiking in is legal (it's quite a hike), but he's not required to allow vehicles so he doesn't. Can't say as I blame him. Peterson Falls is a hike but it's not too far and well worth it. Again, hope you don't mind me sticking my nose into your thread. All your work is much appreciated. Thanks for sharing your experience Dave. Appreciate it. My draft track went across Sullivan but I changed it for economy's sake to the current track. I also don't publish tracks that require a river crossing for obvious reasons. I left some waypoints on the map but didn't route to them (like Manakiki) for reasons like you described. I think I "left you a note" in the Cannonrides thread about this track being local to you but recommending you stay off it for a while because things are really wet and in bad shape in that area right now. Like you say, the mud can be terrible in some places. I also don't publish tracks that require a river crossing for obvious reasons.